This is one of my all-time favorite memories, and I’m so glad I blogged about it originally or I would’ve forgotten about it long ago – or perhaps I should say I would’ve blocked it from memory because it was such a painful experience. I’ve been hankering for another get-away with my hubby (we haven’t had one for just the two of us since this one), but after re-reading this, I think I’ll put my foot down and insist on leaving trailers at home! This past week was the kids’ spring break, so Joshy (as Savannah calls her big, tough-guy, Special Forces brother) flew all three of them to Tennessee to spend four days with him and Jess. Woo hoo! Four whole days without any small fries or sweaty teens underfoot! Whatever would we do? Well, as luck would have it, the kids flew out on a Friday. I took the day off work to take them to the airport and ship them off, but Tom had to work all day, so really we had 3 whole days alone. Okay, that’s still pretty good… Their plane was scheduled to fly in late (and I do mean LATE!) on Monday night. Oh, but wait… We both have to work on Monday. Ah well, that still left us two entire days to be footloose and fancy free! All week long leading up to the big break, we daydreamed about where we would go and what we would do to celebrate our freedom fill the void that would be left in our lives with the kids gone. 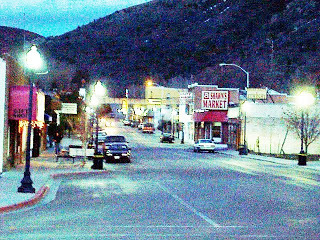 Tom mentioned a road trip to Dillon, MT, a trip we took the last time we took a fun weekend away, roughly TEN years ago. I was all for a road trip, and any time I get to head north to my Idaho roots, even if it’s just passing through, I’m a happy girl. But, why go where you’ve already been? Why not take the opportunity to explore uncharted territory? While waiting for Tom to arrive home late Friday, I wandered cyberspace and Google Maps, plotting our journey, checking weather forecasts, and finding a cozy, little suite (with a gas log fireplace in our room) in a beautiful little Idaho town that I’ve always wanted to visit. I had my speech all prepared and was sure I could successfully argue my case. Here I need to insert a side note: For YEARS upon YEARS, I have tried to talk Tom into going to Lava Hot Springs, a quaint little town in southeastern Idaho that has mineral pools which are so wonderful for soaking life’s cares away, but he has always refused to go. Once he decides he doesn’t want to do something, you might as well give it up, because you are NEVER going to convince him otherwise. I swear that “Stubborn” is his middle name, although he will tell you that I am the stubborn one. Anyway, I didn’t even dare suggest it as I’d lost that particular battle too many times before. Great idea honey! So glad you thought of it :)… I’ll get us a room. But no, he didn’t want a room; he still wanted to haul the trailer and set up camp. Fine… Whatever! We’re going to Idaho. weeks 3 & 4 – running behind!